Geek Fuel EXP is a quarterly subscription box filled with tees, hoodies, comics, and goodies – they promised $100 in value for every box. The EXP box will also feature a Steam game with every delivery – just like the old monthly box. If you want this box, you can still get it as a one-off purchase while supplies last! The Products: Games, toys, collectibles and other exclusive gear. Geek Fuel sends items across a number of different fandoms – this quarter featured 7 different fandoms. The info card is HUGE – it’s like the size of a full-size calendar – and full of details about each item. The Mystic Arts T-Shirt – Value $15? This month’s featured exclusive t-shirt features Doctor Strange. I’ve always loved the designs around this character – especially when you get a good look at everyday life through his eyes in the comics – while this doesn’t entirely capture that, it does capture that great artwork around the spells used throughout the stories. Firefly PIN Palz – Value $15-20? If you were a subscriber to their previous monthly subscription – these should look really familiar! I was excited to see the return of PinPalz in this box – these were always a fun little take on a popular franchise, and usually had some great nostalgic packaging. I got Wash and Zoe – who did you get? Masters of The Universe – 2x Exclusive Keshi Figures Back + Battle – Tats Tattoo Pack – Value $10-15? Super7 is a company that is really bringing a ton of nostalgia back through their old-school figures. This Geek Fuel exclusive gave you a chance to get 2 of 3 little Masters of the Universe figures and their matching stickers – I got He-Man and Beast Man. These are small figurines – each stand only 1.5 inches tall. How cool is this? The box doubles as a Castle Grayskull! Incredible Hulk #1 Canvas Art – Value $15-20? Geek Fuel has been crushing it with this little canvas series they have going. Each canvas is about 6×9 – and, so far, each has included a first-appearance comic cover of a specific character. This quarter featured The Incredible Hulk. Lord of The Rings Mini GeekiTikis – Value $20-25? GeekiTikis are pretty hot right now. At first, I wasn’t really a fan of them, but they have grown on me over time – I actually really love my Rick and Morty GeekiTiki – so I was excited to unbox these. This exclusive set features Frodo and Gollum. These are great to use at your desk for toothpicks, paperclips, or even pencils/pens. Masters of The Universe Battle Tats Tatoo Pack – Value $10? Coming back to the Masters of the Universe franchise, you’ll get a set of 11 temporary tattoos. Something about temporary tattoos definitely screams nostalgia for me – they always remind me of something I’d try to get from those quarter machines at your local grocery store. This was far and away the coolest item in the box – and maybe my favorite item from Geek Fuel EXP so far. This is a soft cover version of the Art of Mondo and features over 300 pages of incredible artwork from some of my favorite movies and franchises – definitely a keeper as a coffee table book. Don’t forget to snag your quarterly Steam game – this delivery features ‘Don’t Open The Doors’. It is very much a mixture of that old-school type of game map with some upgraded graphics. To finish the delivery off with style, they include an homage to the late, great, Stan Lee! Verdict: After 3 deliveries of Geek Fuel EXP, I think I’m liking it much more than their classic monthly delivery. Yes, it arrives less often, but I just love digging through this big ol’ boxes of goodies – and they’ve done a great job of getting great items for each box. 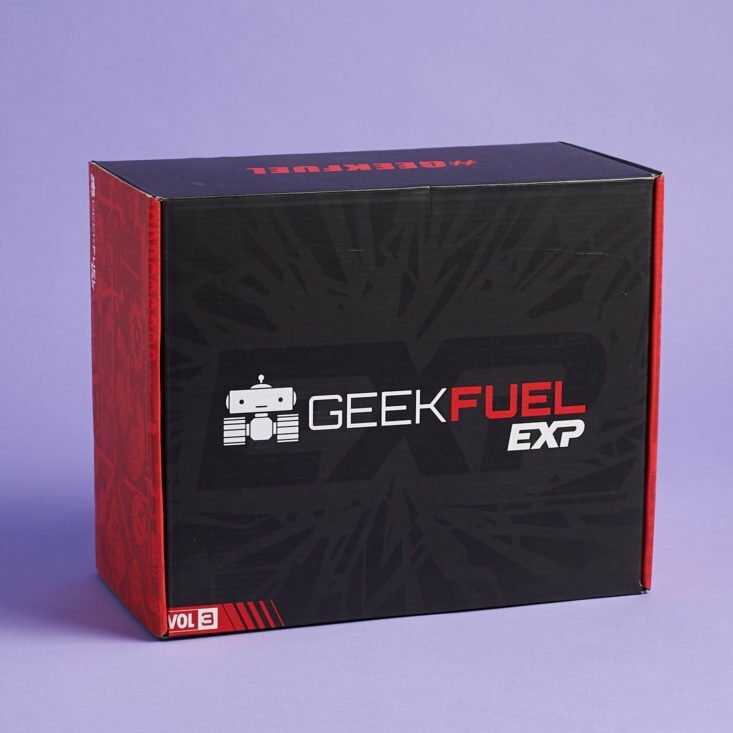 What do you think after the first few deliveries from Geek Fuel EXP? Can you still get this box if you sign up today? Yes! Join today and this will be your first box – just always check the banner on the top of their site to confirm. Check out all of my Geek Fuel reviews if you’d like to see their old-style boxes. Check out all of our Geeky Subscription Boxes in the Subscription Box List. Rate, review, and follow this subscription on the Geek Fuel profile page. What did you think abotu Volume #3 of Geek Fuel EXP? Ick…? What? Who in there right mind would buy this? $70? For key chains & pins? You can buy yourself a nice figure for that price each month and grow an epic collection, and if you start to hate them sell it on eBay most of the time, they go up in price like the Kotobukiya Bishoujo! This is such a waste of money when you can do something better with it!! Agreed. It seems to be nice stuff, but I haven’t hardly liked any of the franchises they’ve done. And the few things I did like ended up being the smallest part of the box. And they seem to be doing the same kind of theme repeatedly to me.